Enhanced protection offering a satin finish. SDF Topcoat is a durable top-coat system that can be applied to any SDF base coat system – for substrates including siding, logs, and timbers. 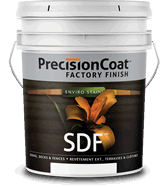 Precision Coat SDF Topcoat is highly resistant to wear, doesn’t discolor over time, and enhances the natural UV protection – and beauty – of your existing Sansin SDF finish. Because of its high solids content, SDF Topcoat enhances the look of your base coat with beautiful saturated color and a full, rich finish.